During my Art Appreciation class today, my professor discussed about famous landmarks and architectural works around the globe. One of the many buildings that he mentioned was the Petronas Tower located in the streets of Jalan Ampang in Kuala Lumpur, Malaysia. Since he hasn’t been there yet, and he was very curious as to what the inside looks like, I showed him the photos that I was able to capture during my trip to KL some time in 2008. I have decided to post it today to share with my internet friends and readers some photos that I was able to take (please excuse the photos as these were taken with an old low-tech digicam). I’m really excited to go back to Malaysia and once again see this amazing architectural structure that was once named the tallest building in the world (from 1998 to 2004, to be exact). 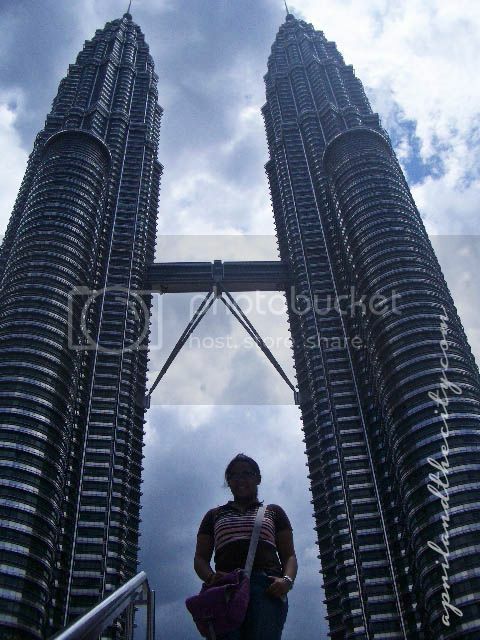 Petronas Towers were designed by Argentine-American architect César Pelli. There are 88 stories in Petronas Twin Towers. Petronas Towers are still the tallest twin buildings in the world. The entry to Petronas Towers is free, but only a limited number of timed tickets are provided on a daily basis. The sky-bridge of Petronas Twin Towers is at 41st and 42nd level and is 58.4m (192ft) long. It weighs 750 tons. oh how i love to see the petronas teowrs in person mabuti ka pa hehehe!off topic, where’d you bought those cool pinkies? i’d really want to collect them. please write back thanks a lot. God bless!